We are usually not fans of FINRA, the Financial Industry Regulatory Authority, but they have an interesting tool on their website which shows the power of low cost investing. We have used all three funds in different contexts. We recommended FICDX in our 2014 UVA Fidelity 403(b) Asset Allocation because it was the only specific free country available. 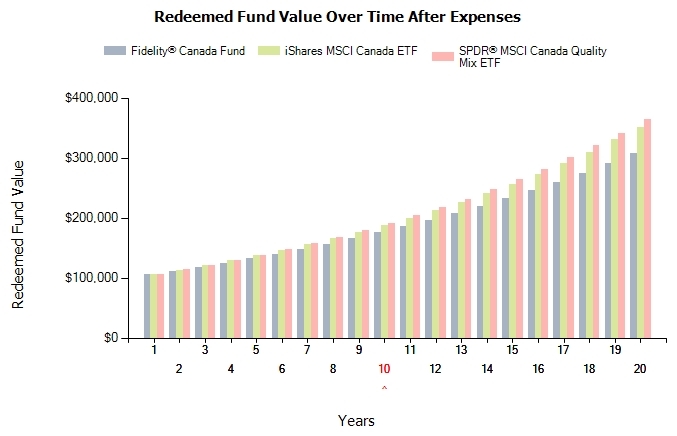 Although, we simplified our asset allocation in our 2016 UVA Fidelity Asset Allocations and removed the fund from our security selection in favor of VTIAX which includes developed countries, emerging markets, and Canada..
EWC used to be our first choice Canada investment, but about a year ago we switched to QCAN in order to have a better quality mix, lower expense ratios, and no transaction fee. Based on this hypothetical scenario, here is the amount you would have paid in fees after a decade to each fund as well as the value of the fund to you after 10 and 20 years. Wealth management seeks to find the small changes that over time have a great effect. In this case, a difference of 0.85% in expense ratio results in value difference of $56,970.22 after 20 years. The work of continually curating a list of low cost funds is extremely valuable.